Want to build deeper relationships and rekindle intimacy within 1 month without another heated argument? 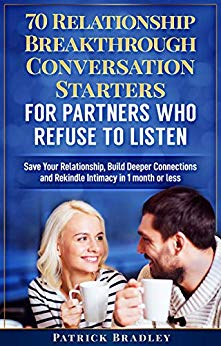 70 Relationship Breakthrough Conversation Starters for Partners who Refuse to Listen will share with you proven insightful conversation starters you can easily and subtlety engage without awkwardness. Inside this book you will discover:•Proven ways to detect and address relationship red flags to avoid being hurt •70 meaningful conversation starters to help you enjoy a more intimate relationship and ensure your inner most needs are met.•How to enjoy engaging conversations with your partner and enjoy a more satisfying relationship. •How to save your marriage from painful blowups if there are red flags or you did a regrettable action •And much much more!Would you like to know more? Simply scroll up and click BUY button to get started.